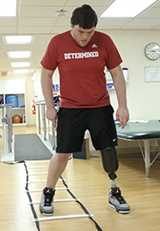 The Marianjoy Orthopaedic/Musculoskeletal Program focuses on patients resuming or achieving active lifestyle goals. Equipment/orthotic or prosthetic review: working and practicing with necessary equipment. Family counseling/support: family members and loved ones learning how to manipulate prosthetic devices and equipment. Peer support: encouraging patients to attend peer meetings and support groups to discuss the challenges and emotions patients face, and to learn more about how to manage their life at home. Vocational and academic services: helping high school and college students prepare to return to school, as well as preparing professionals who plan to return to work.